With Xapo, you can buy, transact, store, manage, and spend your bitcoins. Xapo provides a number of Bitcoin-centric services, including a Bitcoin web wallet, a cold storage vault, and a Xapo Bitcoin debit card. Launched in March 2014, Xapo is based in Hong Kong. Founded by Wences Casares, Xapo aims to provide greater accessibility and convenience when it comes to Bitcoin. Web wallets aren’t the best option for storing your Bitcoin for security reasons. However, Xapo does have a reputation for having some good privacy and security features, such as two-factor authentication. Plus, you have the option of transferring your Bitcoin to the Xapo vault, which is useful if you’re holding them long term rather than using them for daily spending in conjunction with the Xapo debit card (more on this later). Whatever the case, it’s nice to have a choice and an element of flexibility. Keep in mind that in order to manage your Bitcoins with the Xapo web wallet, you must have an internet connection. What I like about the Xapo web wallet is that it’s easy to use. The layout is very simple, which makes it ideal if you’re new to cryptocurrency. Transferring Bitcoin to and from the vault is easy, and being able to see your balance and transactions while on the go is convenient. There’s also mobile support with the Xapo mobile app available on Android and iOS. Think of the Xapo vault like a savings account. It’s the place you move your Bitcoin when you want to hold it long term for additional security. Sending funds from the Xapo web wallet to the vault is easy. In the case of withdrawing funds from the vault, there are multiple security layers to verify your request. The bitcoins are then transferred to your wallet within 48 hours. The vault has a number of security features, such as multifactor authentication and private key segmentation. When you transfer funds from your Xapo web wallet to the Xapo vault, these funds are moved to an offline computer. The data are then encrypted and broken down before being copied onto external drives and paper. Backups are then stored in physical vaults in various locations. Such security procedures are designed to better protect your Bitcoin from possible attacks. Aside from providing two Bitcoin storage options in the Xapo wallet and vault, Xapo also helps in terms of spending Bitcoin. It works much like a regular debit card, with the only difference being that it’s linked to your Xapo web wallet rather than a bank account. 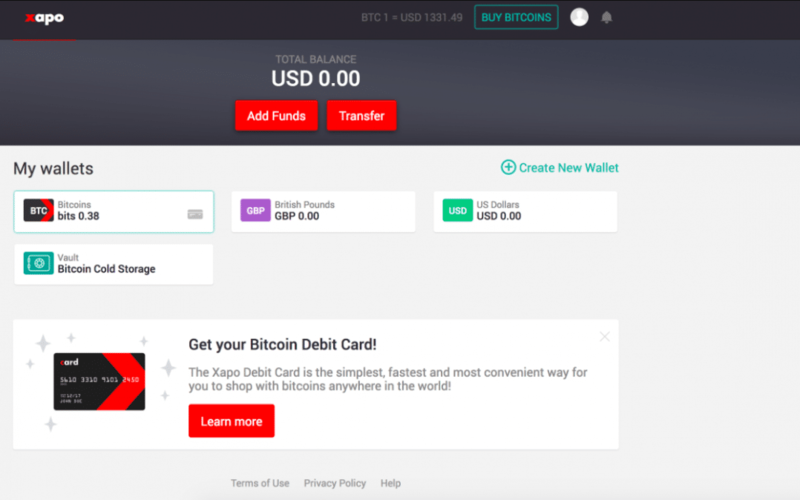 The Xapo debit card allows you to make purchases with your Bitcoin as well as withdraw cash from ATMs. It can be used anywhere in the world that accepts VISA online, with the USD, GBP, and EUR currencies available. It’s easy to keep track of spending because you’re notified of each purchase. 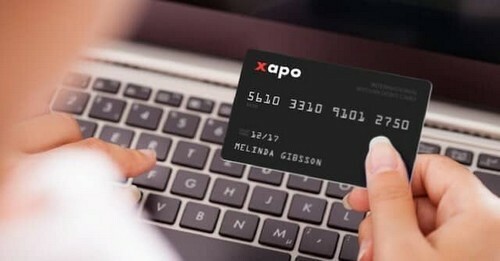 The Xapo Debit Card is designed to allow spending Bitcoin at most credit card terminals. Because the Xapo debit card is linked with the Xapo web wallet and not with the vault, you should avoid sending all of your Bitcoin to the vault if you want to use the Xapo debit card. The card does have daily spending limits, which can be made to be unlimited if you provide the documentation for verification. Otherwise, the standard daily spending limit is $2,500 per day with a maximum of two ATM transactions per day. While both the Xapo wallet and the Xapo vault are free to use, there are some transaction fees. Transferring from one Xapo wallet to another is free; however, there are transaction fees when you send or receive outside of Xapo (such as to or from other wallets or bank accounts). Adding funds incurs a fee of 0.2%, while processing fees may apply depending on the payment method. 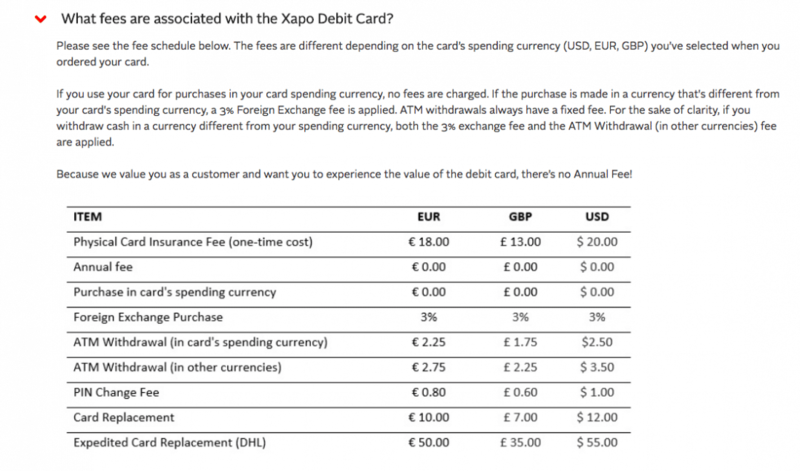 There are also some Xapo debit card fees. This includes a one-time payment of $20 for the cost of the card. Changing your PIN number also incurs a small charge of $1. It works out cheaper if you’re using your card in the card’s spending currency. If you’re using it abroad in another currency, the fees are higher. For example, an ATM withdrawal in the card’s spending currency carries a fee of $2.50, while a withdrawal in another currency has a fee of $3.50. If you make purchases in a currency different from your card’s spending currency, then there’s a 3% foreign exchange purchase fee. While there are negative reviews to be found regarding Xapo, the vast majority I came across provided little substance to their claims. As such, I’d take the negative comments you read online with a grain of salt, much like you would when you read reviews that provide particularly high praise. 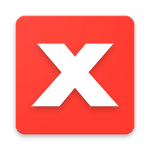 The reviews of the Xapo Bitcoin Wallet & Vault app on Google Play are largely positive, with a 4-star rating from over 30,000 users. There are fewer reviews available for the iOS version, which has a 3-star rating from 360 users as of the time of writing. Xapo customer support is good overall but somewhat on the slow side. Personally, I think that if you’re buying Bitcoin, you’re better off holding it yourself than putting it in the hands of a third party that holds the private keys. That said, it could be argued that the private keys are safer with the security system Xapo employs. Xapo is seen as an established and reputable company, making it a genuine, viable option when it comes to buying, storing, and spending Bitcoin. Mark is a freelance cryptocurrency writer and editor. Upon earning his bachelor’s degree in English and Journalism, he relocated from wet and windy England to sunny Spain. Most of his time is spent expanding his crypto knowledge, watching his beloved Burnley Football Club and complaining about the lack of rain.